Should golfers be more concerned with finishing a certain distance past the hole or optimising the effective size of the hole to give them the best chance of holing a putt? Jonathon, J, Sheppard., Paul, D, Hurrion., & Andrew, R, Collinson. Ball Speed has a significant effect on putting results and should be considered an important factor when putting at any level (Pelz, 2000). Despite this, the ability to control the speed of the ball can often be overlooked which is surprising considering approximately 40% of all shots played on the PGA tour are putts. 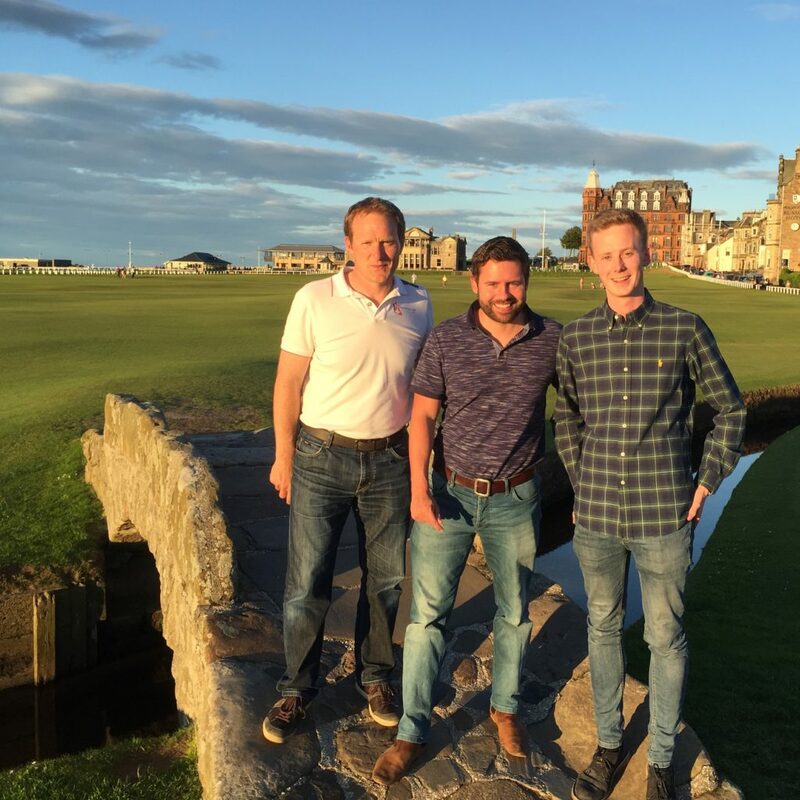 Cochran & Stobbs (2005) describe four reasons as to why a putt might miss. 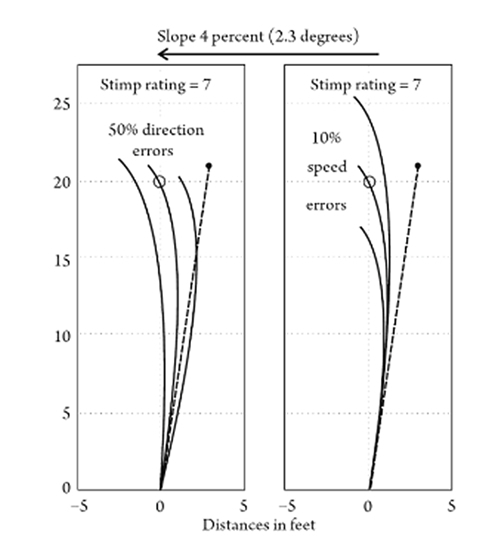 “Speed is more important than target line when on a slope” (Dewhurst, 2015) The errors in direction and speed can be illustrated in Figure 1. The plot on the left of this figure shows the effect of errors in selecting the correct start direction of the putt. The required break for this putt is calculated to be 37 inches to the right (dotted line). The two missed putts were started with breaks of 18 inches and 56 inches, respectively. Despite a major misread, (50% of the estimated break), the ball finished less than 3 feet from the hole. Figure 1 : The effects of ± 50 percent errors in the initial trajectory (left) compared to the effects of only ± 10 percent errors in the putt speed (right). Aimpoint (2013) & Pelz, (2000) identified that the optimum speed of a putt should finish 9 inches and 17 respectively, inches past the hole. However, a common distance referred to by professional golfers is 1 foot or 30 cm past (PGA Teaching Manual, 1990). See Figure 2. However, this distance may be personal to the golfer, or does it even change depending on distance to the hole, along with slope & stimp and even the state of play of the game? Is there a difference in speed with a Par, Birdie or even a Bogey putt? 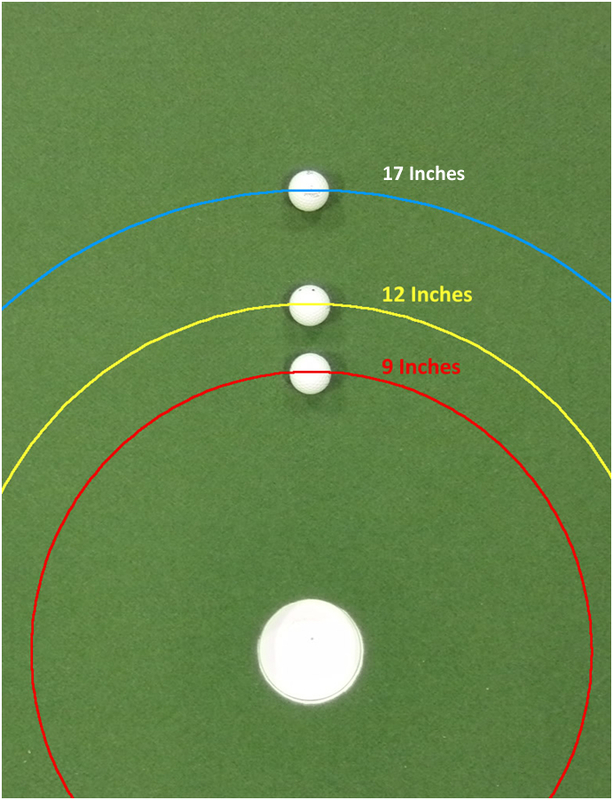 The aim of this study was to investigate the effect of a 3° slope on ball kinematics. The primary objective was to identify differences in the speed of putts that finished 0.30 m past the hole and to determine any effect that this might have on the effective size of the hole. When a ball approaches the hole at a high speed, the likelihood of a successful putt reduces. This can be due to the increased chance of either a “lip out” or the ball might roll straight over the hole. 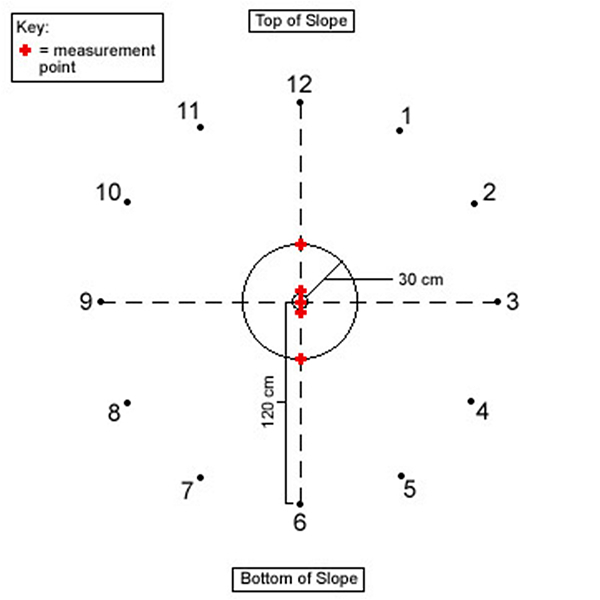 Twelve positions were located equally around a ghost / fake hole in a clock face orientation (Figure 3). All putts were completed using a Perfect Putter (The Perfect Putter, USA), had to pass through the centre of the hole and stop on a ring marked 0.30 m from the circumference of the hole. 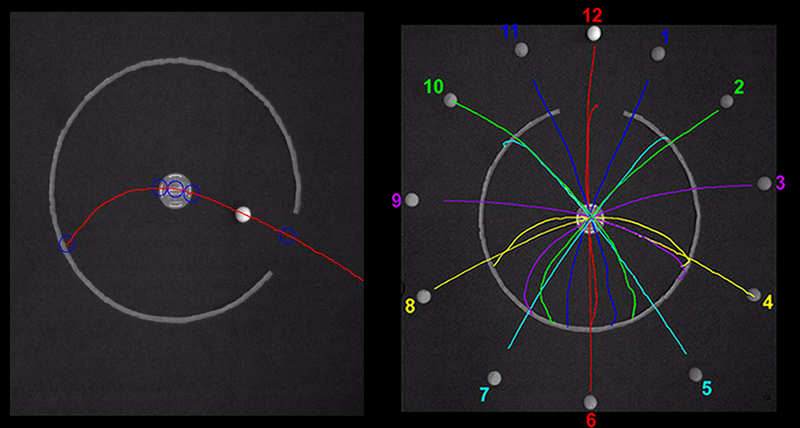 The balls velocity, the distance it travelled and time taken were measured at five locations along the balls trajectory (0.40 m prior to the front of the hole to 0.30 m after the back of the hole) were used for comparison purposes. 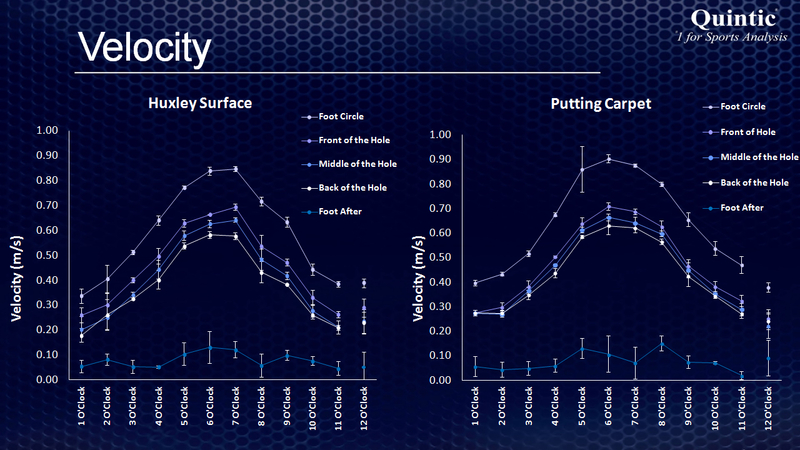 The protocol was repeated on two different surfaces, a Huxley putting green (Stimp 10) and a indoor putting carpet (Stimp 10.5), on a slope of 3°. A Quintic High Speed camera set at 200fps (resolution 850 x 600 pixels) recorded each putt. Videos were automatically digitised using Quintic Biomechanics v26 to find the centre of the ball. Absolute X and Y co-ordinates were exported to excel for further analysis. Finding showed that when putting directly up the slope from 6 o’clock, the average velocity at the front of the hole was 0.66 m/s ± 0.01 (Huxley) and 0.71 m/s ± 0.02 (Putting carpet). However, when putting directly down the slope, 12 o’clock, the average velocity was 0.29 m/s ± 0.03 and 0.25 m/s ± 0.03 respectively. Putts directly down the slope were over two times slower at the front of the hole compared to those directly uphill for both surfaces (Table 1). This equates to differences of 127% (Huxley) and 184% (Putting carpet). Distance travelled to reach the line 0.30 m after the hole was on average 0.04 m greater when from the 4 and 8 o’clock positions (0.36 m ± 0.03) as opposed to the 12 and 6 o’clock positions (0.32 m ± 0.04). This was due to the curvature of the path of the balls putt. all 12 clock face average trajectories overlaid for comparisons. Table 1 : Velocity measures at each measurement point for 6 O’ Clock and 12 O’ Clock positions. Figure 5 : Velocity measures at each measurement point for both surfaces. 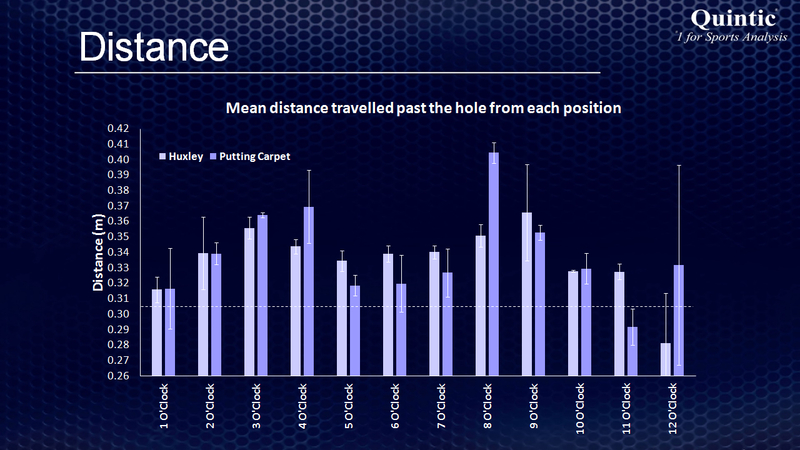 Figure 6 : Distance travelled past the hole for each position. 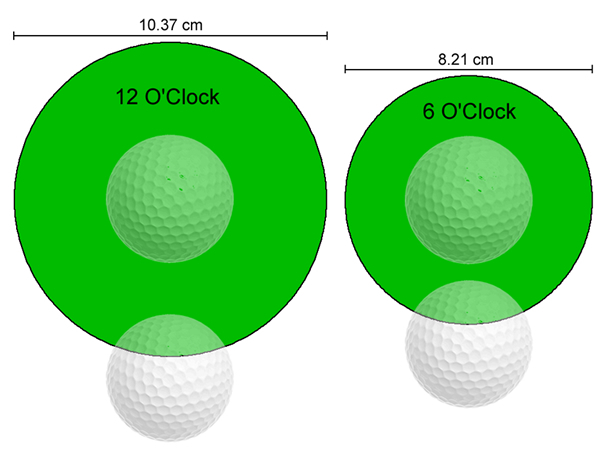 The findings from this study help to highlight the importance of ball speed when putting. Ball velocity was consistently less than the velocity required to fall in at the front of the hole, v < 1.31 m/s (Holmes, 1991). However, the speed of the ball can also have an impact upon the effective size of the hole. For example, when putting directly up the slope, at 0.65 m/s, the effective size was reduced by approximately 25% (Wesson, 2008 & Holmes, 1991; Figure 8). Whereas putting directly down the slope, at 0.23 m/s, resulted in an approximate decrease of only 4%. Similarly, if a downhill putt travelling 0.65 m/s missed the front of the hole, then this could leave an uphill putt of over 4 ft. This brings implications to players of all abilities and probes the question should golfers be more concerned with finishing a certain distance past the hole or optimising the effective size of the hole to give them the best chance of putting? Table 2: Effective Size of the Hole. Figure 7 : Effective Size of the Hole. 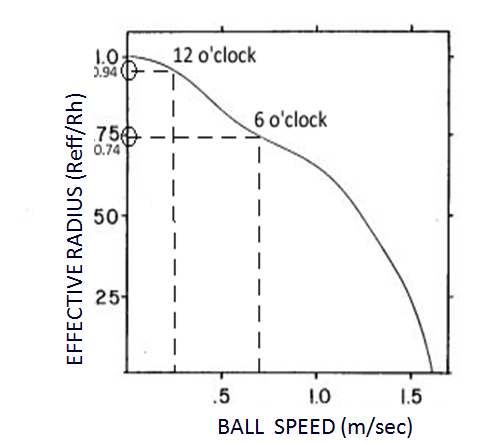 Figure 8 : Holmes (1991) and Wesson (2008) representations of how the effective hole size changes relative to ball speed. The highest and lowest marked velocities at the front of the hole marked from the current study. 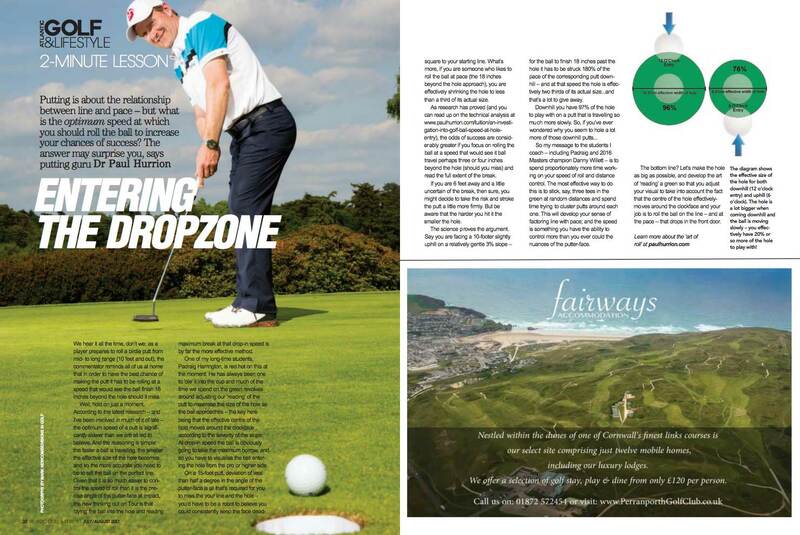 View an article with Atlantic Golf & Lifestyle Magazine! Ball speed is a key component in order to putt successfully. Putts directly down the slope (6 O’Clock) were over TWO AND A HALF TIMES slower at the FRONT of the hole compared to those directly uphill, a difference of 157% to finish 1 foot past the hole. Aiming to leave the ball 1 foot past the hole has a MARKED effect on the effective hole size, particularly when putting on a slope. Entry speed needs to be specific to distance, slope & stimp and may also vary depending on a person’s preference, along with the state of play of game / match. This brings implications to players of all abilities and probes the question should golfers be more concerned with finishing a certain distance past the hole or optimising the effective size of the hole to give them the best chance of holing the putt? Cochran, A. J. & Stobbs, J. (2005). Search for the Perfect Swing. Chicago: Triumph Books. Dewhurst, P. (2015). The Science of the Perfect Swing. Oxford: Oxford University Press. Donaldson, J. (2013, March). Green Reading: Need for correct speed. Aimpoint Golf. Holmes, B. (1990). Putting: How golf ball and hole interact. American Journal of Physics, 59, 129-136. Pelz, D. (2000). Dave Pelz’s Putting Bible: The Complete Guide to Mastering the Green. New York: Doubleday. Riddoch, C. (2013). Expert Putting: The Science Behind the Stroke. Printed by CreateSpace. Wesson, J. (2008). 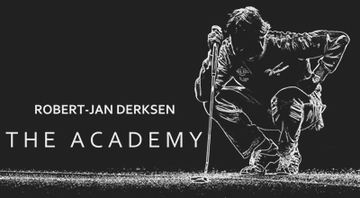 The Science of Golf. Oxford: Oxford University Press. Witt, J. K., Linkenauger, S. A., Bakdash, J. Z., & Proffitt, D. R. (2008). 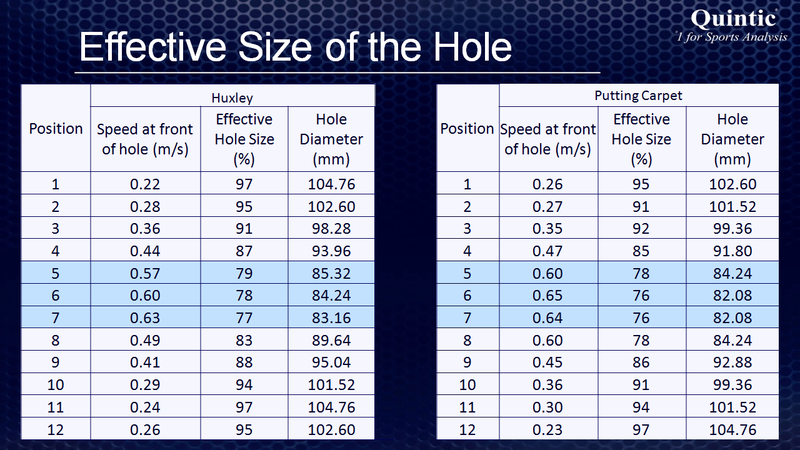 Putting to a bigger hole: Golf performance relates to perceived size. Psychonomic Bulletin & Review, 15, 581-585.